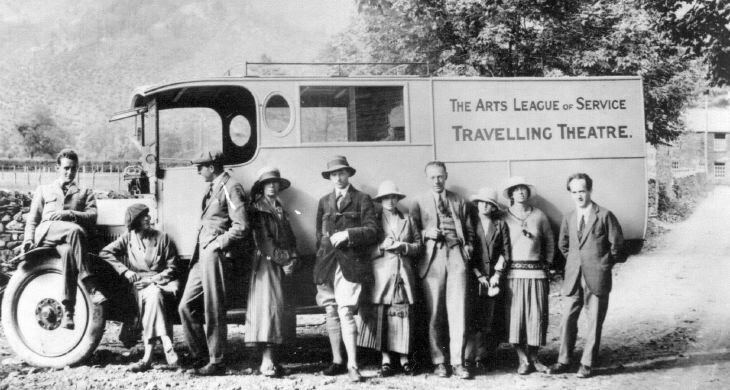 Copy of photo of the Arts League of Service Travelling Theatre. On back in J Bell's writing "link with Hughie the Singer". Hello, Does anybody know if any of the women shown here is Judith Wogan? She was with the Theatre till the late 1920s. She was my great-aunt, never met - would love to know! Thank you. Hi there - I have a copy of Eleanor Elder's book on the Arts League of Service, and this photo is in the book. Judith Wogan is indeed in the picture - the photo caption reads: "Transport in 1922 - The Lancia - Edward Elder, Eleanor Elder, Reginald Gosse, Agnes Lowson, Charles Thomas, Judith Wogan, Cyril Nash, Hermione Baddeley, Winifred Nicholson, Hugh MacKay." ~ Many thanks for the identification of people in this image. ~ Administrator.